A foyer bar will be available to patrons when attending shows in the theatre. Burrinja produces a fortnightly What's On with all the news on latest events and offers happening at Burrinja! Car parking is available in the Burrinja Car Park which is situated off Matson Drive. 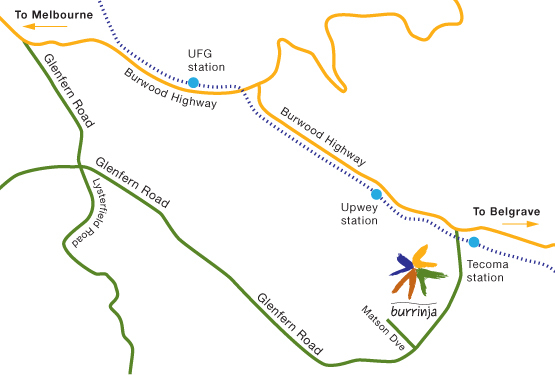 Visitors to Burrinja are encouraged to consider carpooling when attending events and are asked to consider our neighbours when parking and leaving. Burrinja is user friendly for people of all abilities, with accessible parking and elevator access to the theatre, Black Box, upstairs gallery and lower level car park. Burrinja Theatre has wheelchair allocated seating available on request. A Hearing Loop, which covers 90% of the Theatre, works in conjunction with hearing aids with the appropriate switch setting. Guide dogs are welcome at Burrinja. For Burrinja presented shows we offer a second ticket at no cost to Companion Card holders and concession tickets to Carer Card holders. Companion card bookings are not available online. Proof of concession must be presented at the venue.